Craving a blueberry cobbler or berry pie? Want one that's simple to make AND healthy? 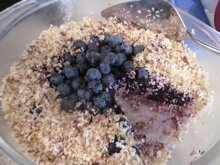 This no-bake and healthy raw food recipe will please everyone who loves berries. It's so good you can even eat it for breakfast (Why not? It's mostly fruit and nuts and coconut like a granola). In a food processor, mix the nuts, coconut, sea salt and cayenne until coarsely ground. Add the dates and mix until it's a bit tacky and holds together somewhat. Pour into a pie pan or other shallow bowl and press down to form the crust. Using a blender, mix the 2 cups of frozen berries, banana, lemon juice, and psyllium husk. To make a berry PIE, pour the filling into the crust. Gently add the whole berries and mix into the filling or dump on top. Refrigerate for about 45 minutes to help it firm up. Tip: If using raspberries, blackberries, boysenberries, or strawberries, blend the filling in a food processor instead of a blender to prevent the seeds from making the filling gritty in texture. Enjoy! Watch how surprised people are when you tell them how easy it was to make and how healthy it is. It's great for parties, potlucks, or anytime you want a healthier, more alkaline dessert option. For even more delicious healthy dessert options, see Ani Phyo's Raw Food Desserts book! Easy Healthy Recipes Make Food FUN Again!